When I talk about my cookbook Good and Cheap with someone who isn’t on food stamps, the most common misconception I hear is that people with limited incomes can’t possibly make some of the recipes — after all, surely they don’t have (say) an immersion blender! But in my experience working with low-income families, I’ve found that blenders, food processors, and electric mixers are actually fairly common; the bigger struggle is getting good food on the table consistently. Even so, there are no absolutes. In 2014, there were 46 million Americans on food stamps. Among 46 million people, there’s every kind of person and every kind of situation you can imagine. So this post is for everyone who has a gap in their kitchen setup, and a little money to fill that gap. I thought, “if I had less than $100 to spend on improving one of my readers’ kitchens, where would I get the most bang for the buck?” I figured we’d skip the super obvious — a chef’s knife, cutting board, and a set of pots and pans — and move on to stuff you might not have thought was affordable. Please don’t feel compelled to buy anything. After all, your great-grandmother didn’t have any of these gadgets (except the cast-iron skillet). But when it’s time to treat yourself, or maybe time to give a gift to a friend, consider the ideas below. Disclaimer: Amazon pays me a small commission if you buy something after clicking one of the links below. However, this doesn’t affect the price you’ll pay — they just take it out of their profit. Also, prices vary day by day, so I’ve listed them as the ranges I’ve seen. For the money, this is my single favorite kitchen tool. I use it pretty much every day to grate hard cheeses or whole spices like nutmeg, zest lemons and limes, and even shred vegetables like zucchini or fennel. By comparison, I only use my conventional box grater a few times per month. I read a funny story a few years ago: apparently the Microplane was originally designed for woodworking, not cooking. Who knew? Instead of steel, the blade on this fantastic little knife is ceramic. That’s why it’s white. It’s much, much sharper than any affordable metal knife, and never needs sharpening. The only real downside is that ceramic is brittle, so you have to be careful not to drop the knife, otherwise it can chip or even break. (I’ve never broken mine, but my mom snapped the tip off hers after a couple of years.) They also come in different colors for only a small amount more. Mine’s red! You don’t need a blender and a food processor, just one of the two. If you already have a blender and you’re short on money, just stick with it! But If you’re buying something new, I prefer a food processor because it’s better at completely pulverizing hard food like nuts. 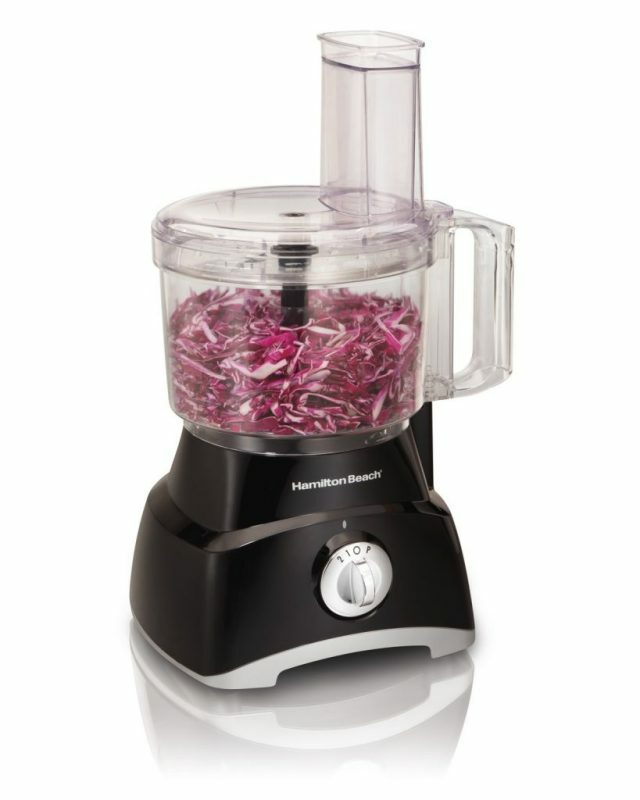 When I got a food processor, I donated my blender to a friend. Honestly, I don’t think it’s important to get a good food processor or blender. Here, I just picked the least expensive model with good reviews — so I haven’t used this one myself. I have a 7-year-old KitchenAid that was twice the price but gets worse reviews. Blenders are pretty common at thrift stores (and sometimes you can find food processors, too); if you see one in good shape for $10, buy it instead of what I’ve linked here. Like countertop blenders and food processors, I think immersion blenders (used to make soups and purées) are basically all the same. Well, not the same, but all good enough for the purpose. 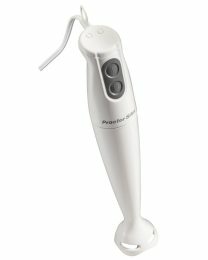 Sure, you can get a really nice immersion blender for $35, but the one I have looks like this basic $15 model. Mine is old and yellowed, but it still works great, so I can’t tell you to spend any more than this! You’ll notice that this one only has a 3.5-star average rating, but if you read the 1-star reviews, you’ll see they’re all from people who were trying to make soap. So don’t use it to make soap! Only soup. Hmm, business idea: t-shirts that say MAKE SOUP, NOT SOAP. With my crustless vegetable quiche, for example, if you sauté the onions in a cast iron pan, you can make the rest of the quiche right on top and put the whole thing in the oven. Fewer dishes! On the other hand, cast iron is really heavy, and it has special cleaning instructions (not hard, just unusual). 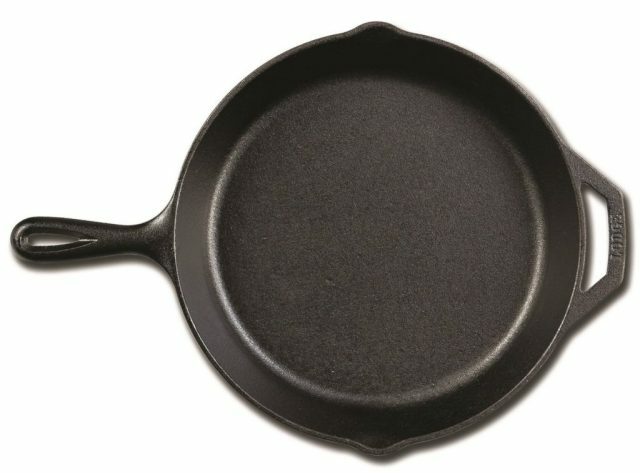 Again, check thrift stores (or antique shops, or the back of your grandparents’ garage) for even better deals than this — 80-year-old cast iron is arguably better than new. If you’re having trouble making ends meet, I’d rather you spend that $11 on a few days of groceries! And my publisher would be happy, too. Thank you so much for writing this book and creating the tempting recipes. The world needs more people like you. Leanne, I don’t mean to rob you of any of your probably needed revenue. However, having been on food stamps myself while my husband was out of work during the Great Recession–that just *happened* to have been when he *happened* to retire from the US Navy after completing 20 years service–I can say that most people on food stamps would be far wiser to check onto their local thrift store to find many, if not all of the items mentioned above. Granted, they won’t find ceramic knives, but there will be food processors and stand up blenders, and cast iron pans by the dozens. A Christmas gift might bring a ceramic knife, but in the meantime, a dollar store will yield two sharp paring knives that are cheap and can be replaced as they dull–two for a dollar. Honestly, THINK about the advice you are giving and the audience you are giving that advice to and the level of true desperation they live with. You really don’t appear to grok it. That $4/day feeds *a family. * My $5 fed a family of 5. To my fellow friends who are or have been on food stamps: learn how to sharpen knives (hint: on Youtube). It’s a worthy skill. You will never have a dull knife and you can buy a cheap, decent knife at the thrift store, sharpen it up and have a great knife. Forever. No expensive ceramic knives necessary. Just a cheap stone and a cheap steel and your skill. You can have a small business sharpening knives. People do it all the time. Think about it. She pretty much says that none of the items are necessary, and even mentions that some can be had from thrift stores. Yes, some (but not all) of those who read this blog are living in “true desperation”, but there are others whose circumstances are only temporarily restricted, and people who may be more financially able but simply want to save money on meal preparation. Should she communicate with only one group to the exclusion of all others? Over the years I’ve been both desperate and the complete opposite. i appreciate her efforts to make suggestions for food prep aids. Just because someone is poor does not mean they have to be infantilized, that they can’t aspire to better things or that they’ll be in despair of being presented with a random gadget they can’t afford. They are as capable of thinking “No, that’s not for me” or “That’s cool, can I find a cheaper one?” as anyone else. And further, they have friends and relatives who may be able to give them things as gifts, or they may want to eventually get it for themselves when able. Part of being desperate in this society, working multiple jobs or spending too much time riding public ttransportation to get to those jobs, is being short on time. Some people would rather buy one good knife that never needs sharpening, versus making repeated trips to replace cheap knives and spending time sharpening. Even when I’ve been poor, I’ve valued quality over quantity instead of instant gratification and held out for nicer things instead of buying inferior products that will break down too soon and eventually need replacing. Let so-called desperate people make up their own minds what’s attainable for them. In a society where everything is cheap and disposable no one will value (and few will patronize) the neighborhood knife sharpener. Thank you! When you throw away those cheap dollar store knives, they don’t really go away. The end up in a landfill or floating in the garbage patch in the ocean. I have made so many of the recipes in this book and I have loved EVERY ONE! Thank you for showing folks they CAN eat well on $4 a day. I received a copy of your book when I signed up to use my food stamps at our local farmers market. It was part of an incentive program to get more low income families to come get fresh produce and live healthier. The town will match up to $10 worth of farmers market money to your $10 worth of food stamps, so I can buy up to $20 worth of produce for $10 in food stamps. I feel your book has been an important tool in liberating the underprivileged in our community from a life of purchasing and killing themselves with seriously over processed and nutritionally deficient food. BTW: I adore your jambalaya and I made it twice before I noticed that it was meatless! Best part is how very quickly that recipe comes together. I checked your book out at the pubic library and fell in love with your recipes and your mission. Thank-you for sharing your passion and bringing light to my kitchen. I recommended you and your book to all my friends on Facebook. Pretty simple comment actually: YOU ROCK! I’m not on a tight budget or live pay check to pay check, so I guess I’m not the target audience here, but I do like to live pretty thrifty. I just happened to stumble on your website and I just want to say that I am so happy that people with a heart like yours exist.Thank you for making this available. I am not living in poverty, but after trying some of your recipes, I am definitely healthier than I was on those “value menu” fast food meals I was consuming day in and day out! Thanks for all your hard work offering healthier and cheaper options for those of us in the middle class!